I’ve recently received several questions on how best to calibrate and profile newer wide-gamut monitors. The questions are likely precipitated by poor-quality profiles generated by older monitor calibration devices. In this post I’ll include a short background on what wide-gamut monitors are, why they are the wave of the future and offer practical advice on getting the best monitor profile for these new monitors. What is a wide-gamut display? Every physical device is limited in the range of colors it can reproduce. An inkjet printer can’t reproduce a more saturated shade of cyan or yellow than the ink contained in the ink cartridge. The amount of red your monitor can display is limited by the hardware used in the LCD panel, and so forth. The range of colors your device can reproduce is referred to as the device’s color gamut. 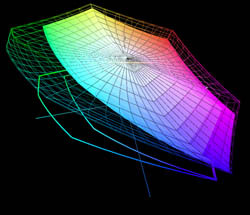 Most monitors have a color gamut roughly approximating the sRGB color gamut. As you’re probably well aware, the sRGB color gamut is smaller than is found in the widely used Adobe 1998 color space. Indeed, many of the saturated colors in Adobe 1998, which can be printed on your inkjet printer are outside the gamut of the sRGB colorspace. This means that even though you can capture these colors with your camera and print them on your printer, you can’t see them on your monitor. Instead, you see an approximation of these colors as limited by your monitor’s color gamut. Wide-gamut monitors eliminate this problem because their color gamut matches a larger percentage of the Adobe 1998 color space. (The actual percentage is usually listed in the monitor’s specifications). The advantage of wide-gamut monitors is that you see the colors contained in your photos and your photos look more vibrant than on a standard-gamut monitor. This helps you to accurately see all the colors present in your original photo. There are two main problems with using wide gamut monitors. Most online graphics and photos are prepared to display correctly on standard-gamut monitors. Most often, this is done by creating graphics in, or converting images to the sRGB color space. This works reasonably well so long as visitors to the site are indeed using a standard-gamut monitor. These assumptions can go terribly awry should a visitor view the site using a wide gamut monitor. Colors in non-color managed photos and graphics look overly-saturated and garish. I’d show you how garish, but you can’t see them unless you have a wide-gamut monitor. For graphics to display normally on a wide-gamut monitor and a standard-gamut monitor, color management is essential. The designer needs to embed the appropriate ICC profile in the images and for graphics, use a file format which supports color management (most do not). From there, the site visitor with the wide gamut monitor needs to use a color managed Web browser like Firefox 3.1+ or Safari. The moral of the story is if you’re using a wide-gamut monitor, be sure to use a color- managed browser. If you’re preparing content for the Web that you think might be viewed on a wide-gamut monitor, be sure to embed an ICC profile and encourage your site visitors to use a color-managed browser like Safari or Firefox. Note: This issue occurs with wide-gamut monitors and any non-color managed application (e.g. Word and PowerPoint). Perhaps more important to photographers is the difficulty in building an accurate color profile of the monitor. To understand exactly why this is problematic, you must know a little bit about the two types of monitor calibration devices; colorimeters & spectrophotometers. Colorimeters: The majority of monitor calibration devices currently on the market are colorimeters. They measure color by passing light through each of three (or more) filters. The intensity of light measured through each of these filters is used to calculate the color of the light being transmitted from your monitor. Spectrophotometers: Used for building printer profiles as well as monitor profiles, a spectrophotometer is capable of measuring the wavelength of light emitted from a monitor or reflected off prints. Many colorimeters currently on the market are designed to work with standard-gamut monitors and are less effective at measuring wide-gamut displays because the filters have not been tailored to measure the wider color gamut of these displays. Spectrophotometers do not require the use of filters, for measuring color so they are unaffected by the monitor’s color gamut. If you’re profiling your wide-gamut monitor, you will get the best results from using either a spectrophotometer or a colorimeter designed for wide-gamut displays. For specific buying advice, I asked the two largest producers of monitor calibration devices to recommend products from their lines. As monitor manufacturers move more toward wide-gamut displays for their entire product line, it is likely that all color management packages will be able to profile wide-gamut displays effectively. What will likely take longer is the improvement in color managing Web content and integrating ICC color management in Web browsers. Thanks Jay for this timely post. I have been struggling all weekend to calibrate a brand new Dell wide-gamut monitor. I have been using an i1Display2 for years but now, thanks to you, I know this isn’t going to work with the new screen. I’m glad I could address an immediate need. It’s always great when that works out. See if you can borrow an i1 Pro spectrophotometer and see if that solves the problem.